During the Irish War of Independence, which ended with the 1921 ceasefire and the institution of the Irish Free State, six men and four women are involved, in different ways, in a delicate plot of betrayal and revenge. The book follows their stories from that moment. The book is in fact made up of five long stories, which share the same characters and the same prologue, whilst still maintaining their own independence. The prologue works as a common thread throughout the entire work. The war is in the background, but at times steps forward as the protagonist. From Dr Jordan’s voice we learn of the actions of the IRA, but also hear the descriptions of gentle slopes covered with heather. We live the tragedy of Sean Glynn, whose soul rather than body has been marked by the conflict and who, after the ceasefire, remains at the mercy of his demons. 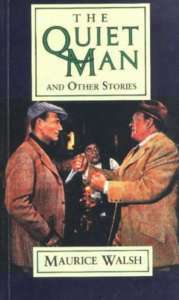 We encounter Paddy Brown’s desire for normality; he is the quiet man of the title of the story, which in 1952 inspired John Ford’s famous film. We the readers are also touched by the ambiguous charm of Nuala Kierley, both victim and oppressor, who is the driving force behind the narrations. Despite the background of the war, the text does not have the features of a war book but rather of a political work, a tribute to the fatherland and to the right of a people’s self-determination. The author maintains a good balance between tragedy and humour and, despite the dark historical context, breathes life into a world that is able to find moments of light heartedness in the fishing competitions, in the romantic tensions, in the witty dialogues. Episodes of war alternate with scenes of nature, narrating voices interchange and registers vary according to the different prevailing themes. There are recurring motifs: the love of the fatherland, friendship (at times stronger than the bonds of blood), the emancipation of women, the sentiment of love which requires that common values be shared. Walsh’s protagonists are not soldiers but patriots, fighters who have not forgotten their inner selves as quiet men; the book is the story of their troubled return to this previous condition. A collective and evocative work which displays a surprising modernity.